Blaze: 35 firefighters at the scene in Essex Road, Islington. London Fire Brigade. Kebab shop. 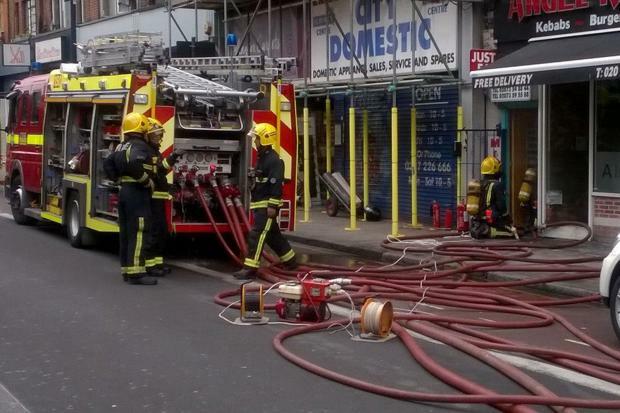 Dozens of firefighters tackled a blaze at a kebab shop in Islington this afternoon. 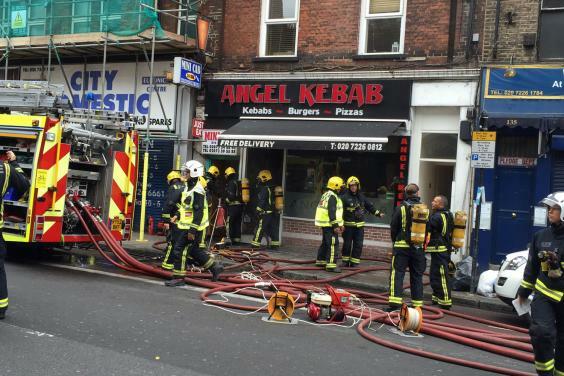 A basement beneath Angel Kebab takeaway and flats in Essex Road, Islington, caught fire in the early afternoon. More than 30 firefighters were sent from Holloway, Shoreditch, Euston, Stoke Newington, Kentish Town and Soho to tackle the blaze. London Fire Brigade said they were called to the scene at just before 12.50pm and by 2.23pm the blaze was under control. The cause of the fire is not yet known. Blaze: The basement below Angel Kebab on Essex Road is alight. The fire brigade urged people to avoid the area as the road is blocked off and traffic disrupted. There are now 6 fire engines at the fire in Essex road #Islington. There will be some traffic disruption, please avoid the area. Transport for London said Essex Road is closed between New North Road and Upper Street and buses are being diverted.